Patients are hyperglycemic for a mean period of 36 to 30 months before a diagnosis of pancreatic ductal adenocarcinoma (PDAC), researchers report in the August issue of Gastroenterology. This information might be used in strategies for early detection. Levels of FBG and CA19–9, and lymph node involvement with increasing tumor volume of pancreatic cancer. VDM, volume associated with diabetes; VDX, median volume at diagnosis. At the time of PDAC diagnosis, approximately 85% of subjects have hyperglycemia and 50% have diabetes. So hyperglycemia could be a marker for early cancer detection. Persons with new-onset diabetes have an approximately 8-fold higher risk for PDAC. Diabetes resolves following tumor resection, so the hyperglycemia is likely to be induced by the pancreatic cancer. 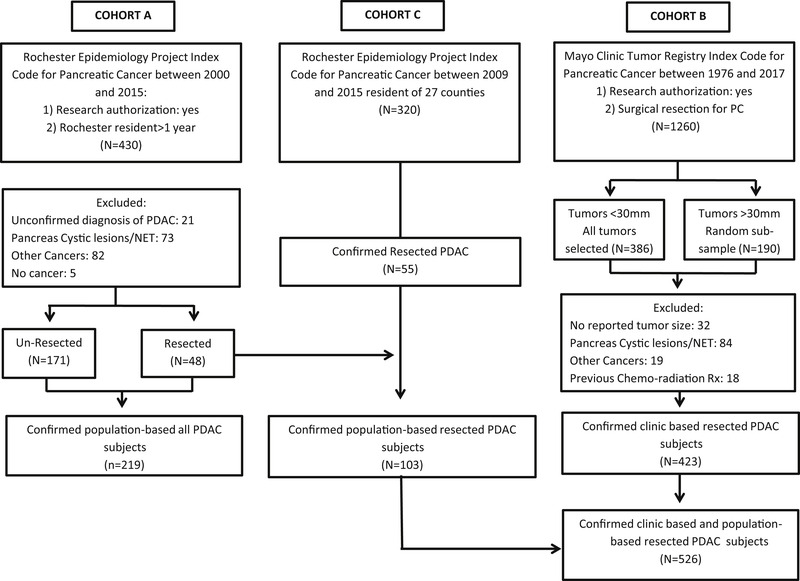 Ayush Sharma et al aimed to estimate the duration of sporadic PDAC before diagnosis, based on time of hyperglycemia before cancer identification. Collecting data from 3 large cohorts of patients diagnosed with PDAC over a 16-year period in Olmstead County, Minnesota, Sharma et al compared mean fasting blood glucose (FBG) levels over time with those of the Olmsted County population (controls). In the one cohort (cohort A), a significant increase in mean FBG level was observed in patients vs controls starting at 36 to 30 months before a diagnosis of PDAC. The level increased until detection of the tumor. In another cohort (cohort B), mean FBG levels and proportions of patients with diabetes increased with tumor volume (see figure). 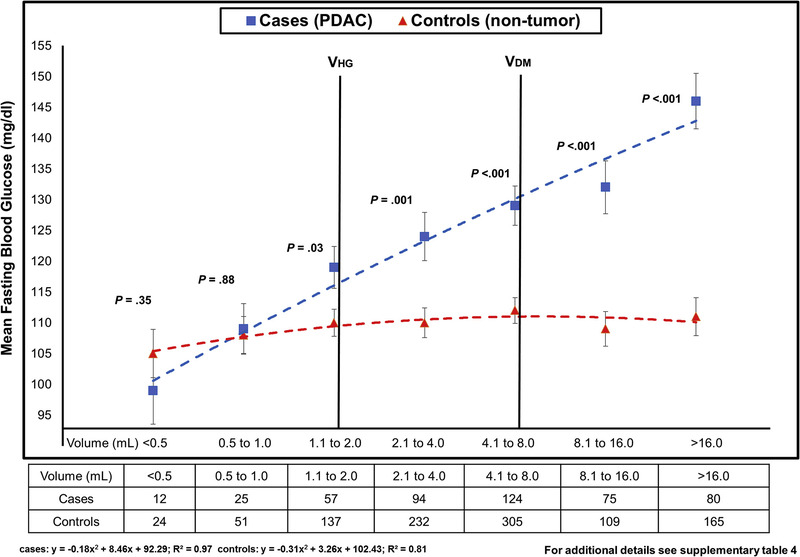 The FBG level of patients with PDAC became significantly greater than that of controls in patients with tumor volumes of 1.1–2.0 mL. 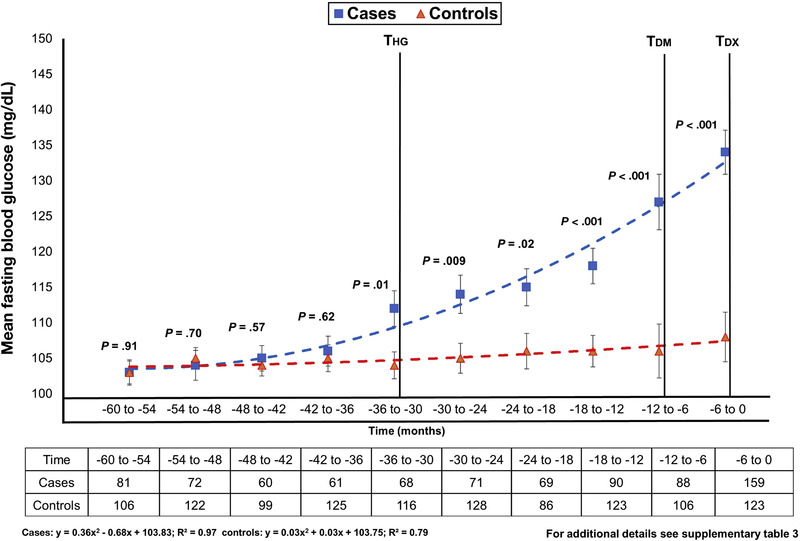 The mean FBG level peaked above diabetes level (>126 mg/dL), at tumor volumes of 4.1 to 8.0 mL. In analyzing data from third cohort (cohort C), Sharma et al found that in patients with large tumor volumes (≥16.1 mL), hyperglycemia was recorded as early as 36 months before PDAC diagnosis. In patients with with medium tumor volumes (8.1 to 16.0 mL), hyperglycemia was recorded as early as early as 24 months before PDAC diagnosis. And in patients with small tumor volumes (<8.1 mL), hyperglycemia was recorded as early as 12 months before PDAC diagnosis. 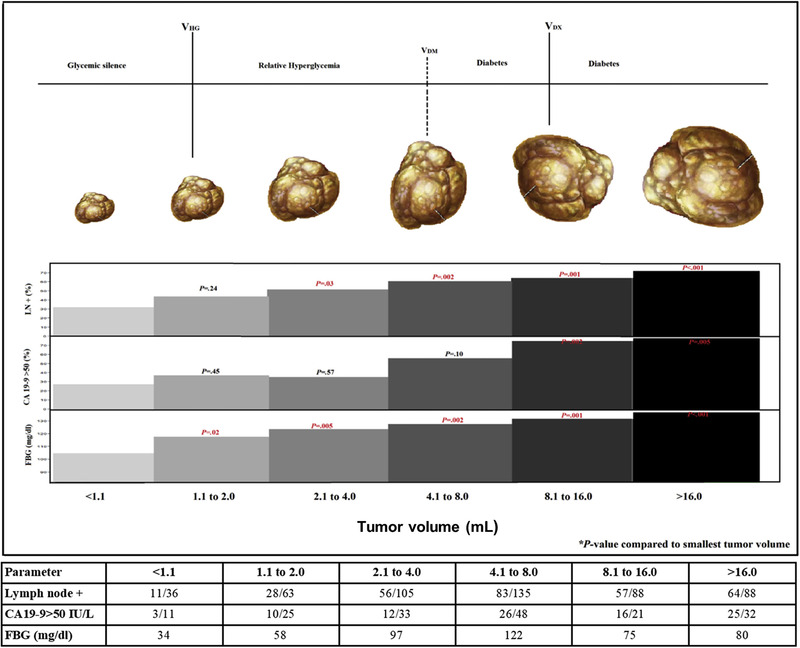 The mean FBG levels of patients with well to moderately differentiated tumors was lower than that of poorly differentiated tumors (118 vs 134 mg/dL). Sharma et al conclude that hyperglycemia occurs in patients 30 to 36 months before diagnosis, associated with tumor volume threshold of >1.1 mL, and is caused by invasive cancer. FBG levels reach the diabetes threshold 12 to 6 months before cancer diagnosis. It is not clear how PDAC induces hyperglycemia, but studies have identified factors produced by cancer cells and the tumor stroma that induce insulin resistance. In an editorial that accompanies the issue, Kjetil Soreide explains that pancreatic cancer cells release exosomes that deliver adrenomedullin to beta cells, leading to beta-cell dysfunction and death, and consequently to hyperglycemia. Sharma et al state that between the volume of smallest tumor associated with hyperglycemia and typical volume of tumor at diagnosis, the tumor doubles in volume 4 to 5 times. This provides ample opportunity for early diagnosis of PDAC. However, Soreide points out that the difference in FBG between pancreatic cancer and controls start at tumor volumes of >1 mL, when a median tumor diameter was 18 mm (range, 15-20 mm), with the signal becoming stronger at volumes of >2.0 mL (diameter, 22 mm; range, 20-25 mm). He says that these volumes are at the high end of what is considered early-stage pancreatic cancer (<20 mm; pT1 stage). Further studies are therefore needed to determine whether detection of hyperglycemia can be used in early diagnosis, when cure is still possible.